Death by chocolate cake might literally kill you. Seriously, this cake is so rich, so decadent and so tender, you might not be able to stop yourself at a reasonable sized slice and you may need to be escorted away from the cake. 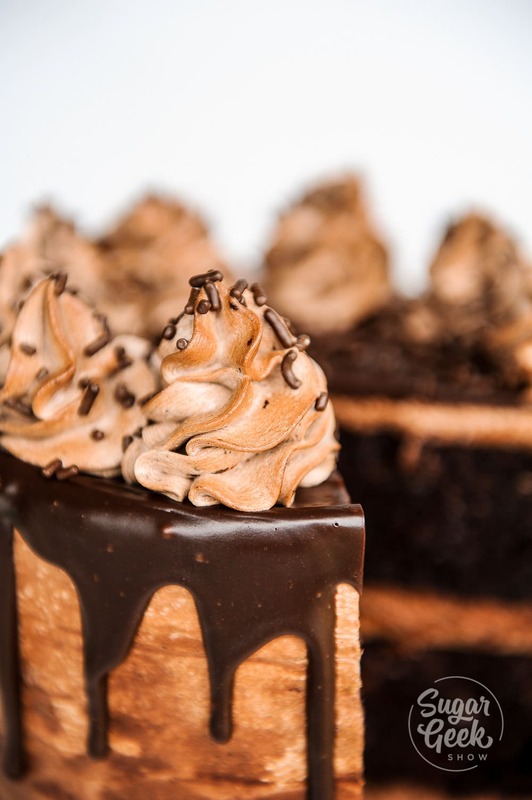 Paired with creamy dreamy chocolate cream cheese frosting and topped with a silky ganache drip, you might be dead but at least you’ll be happy. If you like my Guinness cake recipe then you’ll LOVE this cake! 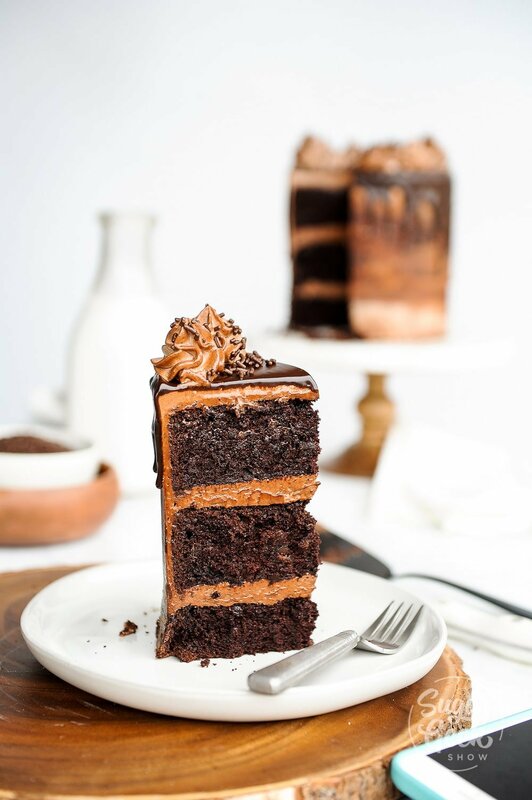 Originally I wanted to name this cake “I must really love you” chocolate cake because to be honest, there are a ton of steps in this chocolate cake recipe and some fun ingredients like Guinness beer, espresso powder, mini chocolate chips and mayonnaise. When I first made this cake, half way through I thought there is no way I’m making this cake again, it’s taking way too long! But then… then I tasted it. And I died. I died a delicious chocolate death and then I was re-incarnated thankfully so I could go in for a second bite. This is hands down, the MOST amazing chocolate cake I’ve ever personally tasted. It’s so moist it’s almost on the verge of being TOO moist. Is that a thing? It’s so fully of chocolate flavor it’s practically fudge. The second time I made this death by chocolate cake was for my best friends daughter’s birthday. She is a chocolate fanatic and also a big fan of mermaids. I wanted to see if this cake could hold up to sculpting. I chilled the cakes before I set to carving so the butter would help keep things nice and stable. It was very tender carving but it held up and I got SO many compliments on the flavor of the cake. My best friend told me it was the best chocolate cake she ever had and I don’t know about your best friend but mine isn’t one of those that tells you what you want to hear. I knew this death by chocolate cake was a winner! Even though it has some extra steps in there, it’s so worth it! Now I know there are a lot of death by chocolate cake recipes out there but a lot of them start with a box mix. There’s nothing wrong with that but I personally love baking from scratch so I can control every aspect of the cake. Too sweet? Reduce the sugar. Not moist enough? Up the liquids. Not chocolatey enough? Switch out the cocoa powder. You can’t get that kind of control with a box mix and I am type-A control freak all the way. Before you start this recipe, I highly suggest you go through the ingredients to make sure you have everything on hand. I myself didn’t have any dark beer so I had to grab some and I didn’t have an espresso powder. The first time I made this cake I used chopped chocolate but that was a huge pain so I switched to mini chocolate chips and that worked just as well. I don’t recommend using regular chocolate chips because they are too big and will sink to the bottom of the pan. Ok so let’s break this down. First combine your dark beer with your espresso powder and vanilla. This is your liquids. Now let’s sift together the flour, cocoa, salt, baking powder and soda and set aside. These are your dry ingredients. Add your softened butter to your stand mixer with the paddle attachment and cream it until smooth. Sprinkle in your sugar and mix on med-high until light and fluffy. Now you want to add in your room temp eggs to the butter mixture one by one. don’t rush this. Forgot to bring your rooms to room temp? I put mine in a bowl of warm water for 10 minutes and it does the trick. Beat until light. Add in the mayo and mix until combined. With the mixer on the lowest speed add in 1/3 of your dry ingredients and mix until combined, then add in 1/3 of the liquids until almost combined. Repeat this process two more times. Gently fold in the chocolate chips and then pour into the prepared pans. Bake for 30-40 minutes until a toothpick comes out clean but with a few moist crumbs stuck to the toothpick. Don’t over bake. Let your cakes cool and then chill wrapped in plastic wrap until firm before frosting. 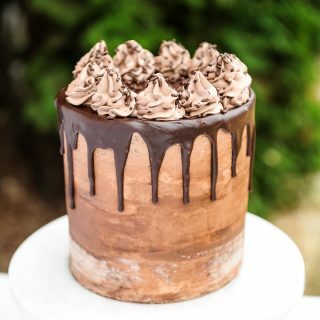 I chose to go with a super yummy chocolate cream cheese frosting (adapted from Iambaker chocolate cream cheese frosting recipe) for this cake and it compliments the cake perfectly. Top the cake with a nice ganache drizzle and some chocolate jimmies. Want even more chocolate madness? Pile on your favorite chocolates on top of the drizzle for a step beyond death by chocolate and moving into reincarnation. Be sure to watch the full video on how to make this super yummy death by chocolate cake! 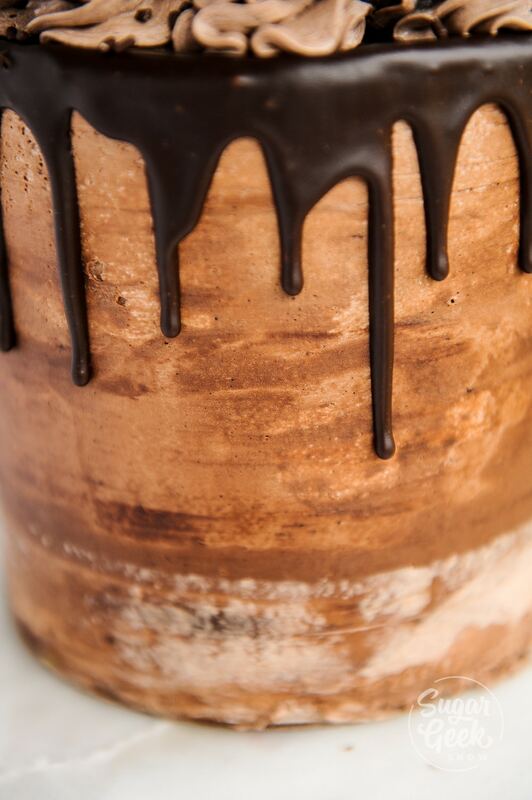 The perfect cake for the die-hard chocolate lover in your life. 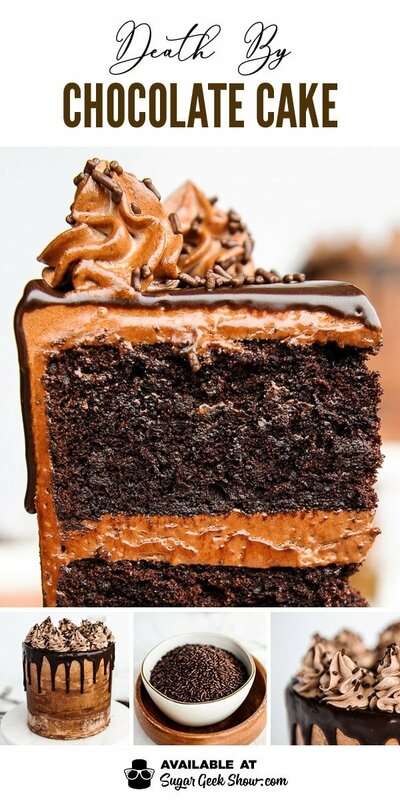 Death by chocolate cake is a chocolate lovers dream! This cake get's it's intense chocolate flavor from Guinness beer, mayonnaise, espresso powder and mini chocolate chips. Paired with chocolate cream cheese frosting, you might be dead but you'll be happy! This chocolate cake isn't for the faint of heart! This recipe makes 6 cups of batter and is enough to fill two 8"x2" cake pans. Melt your chocolate in the microwave or over a bane marie until smooth then let cool to about 82 degrees. Should feel slightly cool to the touch but not solid. Place softened cream cheese into the bowl of a stand mixer with the paddle attachment. Cream until the cream cheese is smooth and there aren't any lumps left. Add in the softened butter and cream until light and fluffy. Combine the cocoa powder and cream and whisk until smooth. Add the mixture to the cream cheese and butter mixture on low. Add in the cooled melted chocolate and stir to combine. Add the powdered sugar to the mixture one cup at a time while mixing on low. Let mix for 2-4 minutes on med high. Heat cream slowly until it just starts to bubble, pour over chocolate and whisk until smooth. 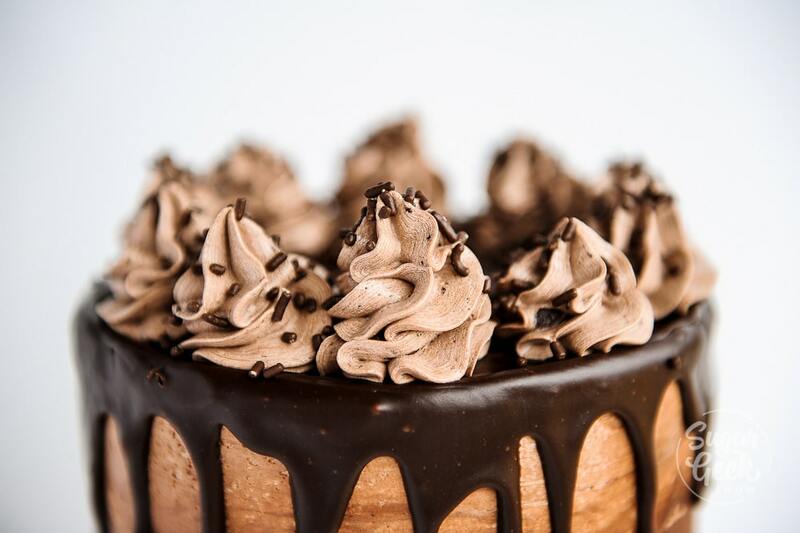 Place ganache into a piping bag and drizzle over the top of your chilled cake. Omg! I’m going to make this on the next cake order. But your video doesn’t work😧 Can’t wait to make it. Thank you Liz! I made your Black Velvet Cake this weekend. Can it actually be better than that recipe?? Haha I think this is the most decadent cake I’ve ever tasted! VERY chocolate-y! Would you say this is better than your original chocolate cake recipe? I always use that when I need a chocolate cake it’s my go to! I would also like to see the video. The recipe looks great but that extra help of watching the actual process always helps. The video isn’t “available” ? I wasn’t able to watch the video, either. (Says it is unavailable.) Liz, I made your Black Velvet Cake this past weekend and OMGosh I thought it was heavenly. You’re telling me this is even better? Okay, I’m game. I’ll try it. Thanks! Can oil be subbed for the butter? Is it safe for kids if it has beer? Also could you plz let me know are you keeping the cake with cream cheese filling in fridge or outside? I personally not keep fondant cakes in fridge but this one looks yummy and also ingredients like cream cheese needs to be in fridge yes? Alcohol bakes out of the cake so it’s perfectly safe for anyone to eat 🙂 Cream cheese frosting is always kept refrigerated except right before serving. Mini chocolate chips missing from ingredients list? can u please tell me a non-alcoholic substitute for stouts beer? we don’t take alcohol in any form even if it evaporates while cooking. would love to try this cake. tia. Hi! There are no mini chocolate chips measurement listed under ingredients. How much would you add? Hi, The measurement for chocolate chips to be folded into the cake isn’t given. What can I use as a substitute for the beer as I don’t drink alcohol? I love the sound of this recipe and want to make it soon. I would also love to watch the video to see how you frosted it to get such a cool effect, but the video is not available. 🙁 Thank you! This recipe sounds delicious, but I’m a little confused by the frosting directions. It doesn’t say where to add the 8 oz. of melted chocolate, does it go in with the cream cheese? Also, how much ganache would you make to cover it? How do you get your nutrition facts? They are pre-calculated by the app, The serving size is ONE cake haha! Sounds delicious can’t wait to try it. 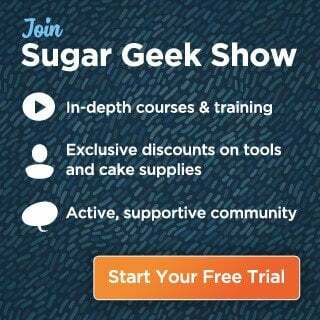 I just signed up to be in your Facebook group! Your recipe sounds so good. What is this dark beer. In India I don’t know if it’s available. Can I use any beer? This cake is delicious but I’m slightly confused by the cocoa powder/ heavy cream mixture when making the frosting. 4 tbsp of heavy cream mixed with 2 oz of cocoa powder just yielded a clumpy mixture for me. Did I do something wrong? i just made this last night… ended up adding double the cream and it was still very dense but yes, smoothed out nicely once mixed. Just made this to take to family reunion. It turned out beautiful! Needless to say, I had no leftovers to take home. I just made this cake for a customer. Instead of 2 8″ pan, I divided it into 3 6″ pan. I had extra so I made mini cupcakes to bring to work but my husband and kids ate it all. It was so delish! The only problem I had was crumb coating. It was so crumbly. It really needs to be chilled. I’m happy with the results. Thank you again! Yes chilling cakes before frosting is always a must because it hardens the butter in the cake and keeps it intact. I’ll be sure to update the instructions to include that information. If I was to make this in 6X3 pans about how long do you think would they need to bake? Can’t wait to try this!!! I tried this recipe before going to work. i baked it for 45 minutes at 330. After cooling for 10 minutes, i turned over one pan into the rack, and it collapsed! I felt so sad, as it had a lot of steps! I’ve since gone to work. Do you think i can still try to bake the 2nd pan for more minutes when i get home? Hi. I want to make this recipe for my my niece’s birthday. What can i alternate for stout beer? Good Day! My question is, your #1 states: — NOTE: It is SUPER IMPORTANT that all the room temperature ingredients listed above are room temperature and not cold so that the ingredients mix and incorporate correctly. — however, I don’t see any ingredients listed as “room temperature”. Am I assuming right when it’s the butter, eggs and heavy cream. Most everything is measured out and ready to be mixed. Just waiting for the beer to come home (room temperature??). I’ll let you know how it turns out. I’m a bit nervous after reading the comments. I only have one 8″ pan, so I was going to bake one cake and then bake the other after that (but I see you’ve commented to someone that it won’t rise if I do that), so it’ll be two batches of batter (plus two extra cakes I can put in the freezer). Providing the first one turns out. Wish me luck! Anything cold needs to be room temperature when you use it so eggs, butter, beer. I’d love to try this cake. I see in the recipe it calls for 14oz of Stout (450ml) But in your video I see 300ml (10oz) stout?? I ran out of Dutch cocoa, only have about 3.5 oz. Can I use regular cocoa to make up the difference.? Hi there! This recipe looks really amazing! I was wondering if it would also be good to use for cupcakes? I have seen in other recipes on here that if you start the cupcakes in the oven at a higher temp for 5 minutes and reduce it to the 335 for the rest of the cooking time, that they have had good success. Will that same process work for this recipe? I absolutely cannot wait to try this out! Yep! You are correct. This makes great cupcakes too. If I do the 5 minutes at 400, how long should I keep them in at 335? I did 13 yesterday. Can’t wait to try all of your recipes! Even though that batch was dry (my fault) they were still incredibly delicious and that rarely happens with dry cake! Okay! I think I need to go ahead and invest in an oven thermometer. I think I may have over mixed a bit too, so I’ll try to focus more on that stage as well. Hi need to know if chocolate chips would melt in cake ? Hi Liz, I am making this cake next Monday for an 18th birthday. He likes the vanilla buttercream frosting. I really like to bake and try your recipe, it looks so delicious. Do you think Vanilla buttercream go with this cake recipe? Please help me. Thank you. Success 😘, Thank you so much Liz, everybody loves your cake, very rich and sooo delicious to the last bite. Just made this and did mini cupcakes for a little marketing thing I’ve got going on right now. Pretty excited to use this to lure in new clients. Lol. Thanks as always!….Amy B. The recipe indicates cooking the caje batter in 2-8″ pansYet the video shows a 3-layer cake. The recipe makes two 8″ round cakes or three 6″ round cakes which is what is in the video. This recipe is superb! Everyone loves it! Thanks for sharing! 😀 (re-posting because I forgot the stars!). Hey! 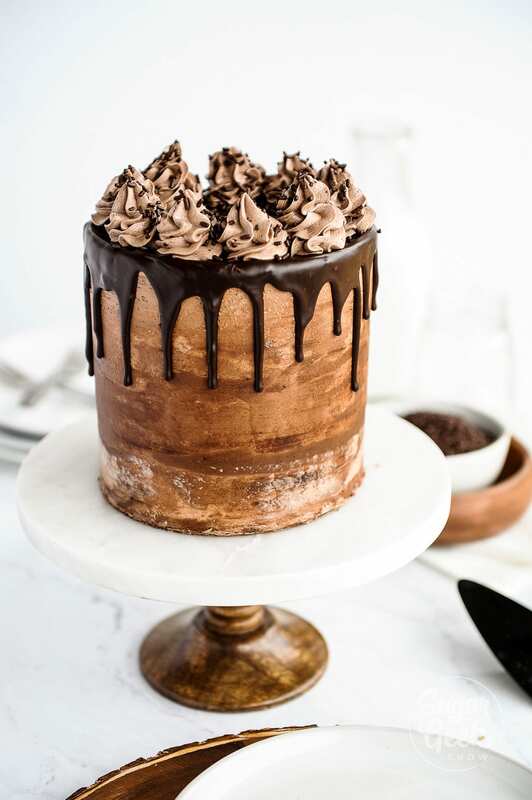 Totally making this for my boyfriends birthday next weekend….How long would you recommend baking the three 6” cakes for ( instead of the two 8” cakes)? Thanks! Should I make 1 1/2 batches to better fit 2 9″ pans? Also, is there a brand of Dutch cocoa you recommend? I’m struggling because I want to use quality chocolate in my recipes but can’t find a good place to buy it in bulk. ya buddy! 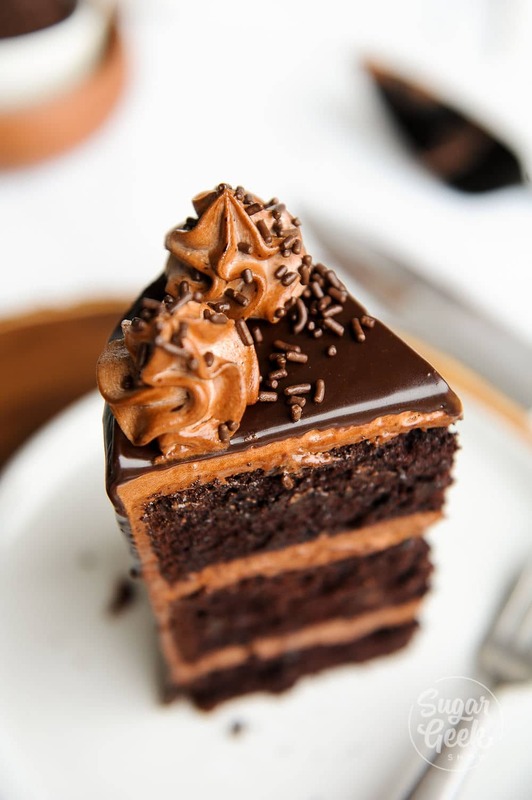 This is a favorite chocolate cake amongst my friends as well. It’s a bit labor intensive but the chocolate cake comes out soooo moist! Made your chocolate carving cake and it was amazing! So wanted to try this out because it sounds delicious! Just wondering if I made the cake one day, wrapped and kept in fridge until the following day to frost, is that too long to keep them refrigerated without frosting? Also, with your cream cheese frosting, will it hold up if I make it and leave in fridge for a few days before using? Thank you so much! Your a Rockstar Cake Artist! OMG!!!! This is the best chocolate cake I have ever eaten, let alone made!!! You rock Liz!!!! Would love to try this for my boyfriends birthday! How many cups of batter would you recommend for a 3 tier 9 inch cake? Yes, that’s what I meant 🙈 Thank you! The frosting recipe calls for 8 oz Melted Chocolate. Is that dark chocolate? semi-sweet chocolate? milk chocolate? unsweetened chocolate? For religious reasons, I do not want to use the beer. Is there any other liquid I can use that will give me the results as close to the original recipe? 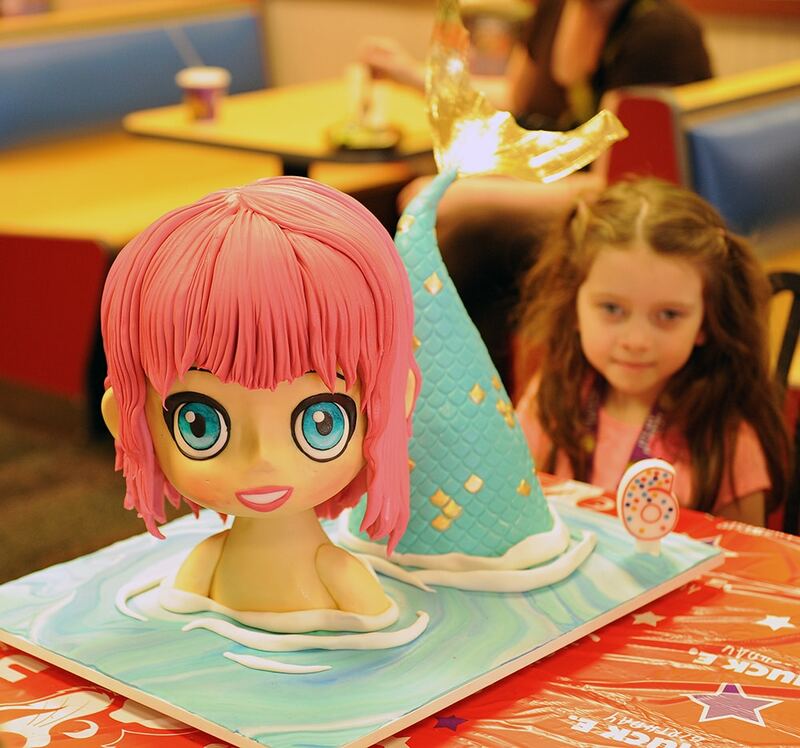 You can either do two 8″ cakes or three 6″ cakes (2″ tall pans). A slow bake does not necessarily remove the dome off a cake. It just depends on the recipe. Can this cake be stacked? I want to make a 2 tier cake. Also,will it work with a 9inch with a 6inch as the tier, if so, will both need to be 3 layers or can the 9 be 2 layers while the 6 inch be the 3 layers? I did the vanilla cake but it was too much crumbs and made it hard coat, what do you recommend I do? Hi so I think I totally wrecked my first attempt. Could you specify weight vs volume? Weight is using a scale, like if you weighed yourself. Volume is in cups, which isn’t accurate. I love all your stuff I signed up for elite membership. I made the cakes and chilled overnight, but I keep getting lots of crumbs, what am I doing wrong?? I have been unable to find espresso powder. 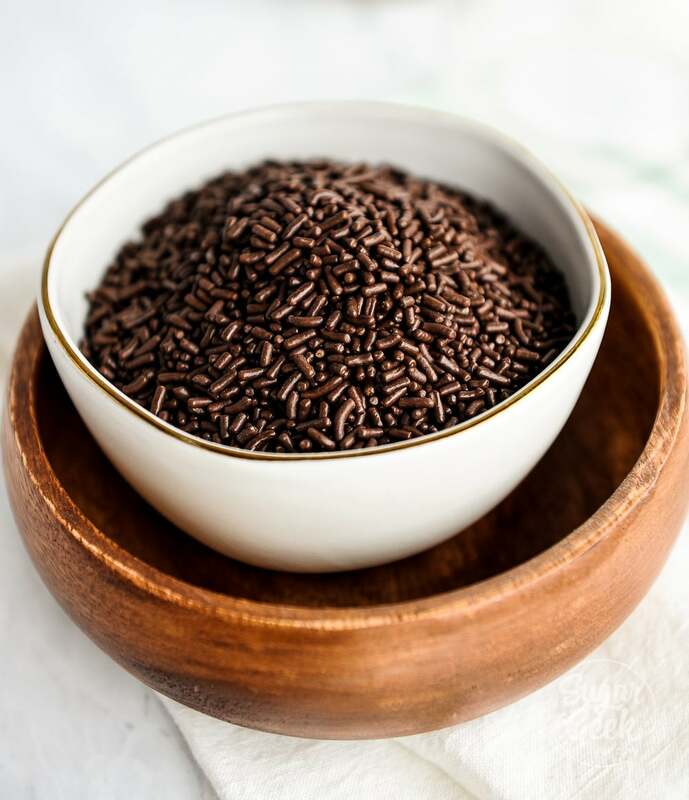 Is instant coffee a good substitute? Thank you so much! Mayonnaise doesn’t have garlic in it, unless yours does in which case don’t use mayonnaise with garlic in it. Just regular mayonnaise. I made this cake yesterday and it turned out great! It is moist and tasty! Thank you, Liz!!! The only complaint was that it is a bit too sweet. 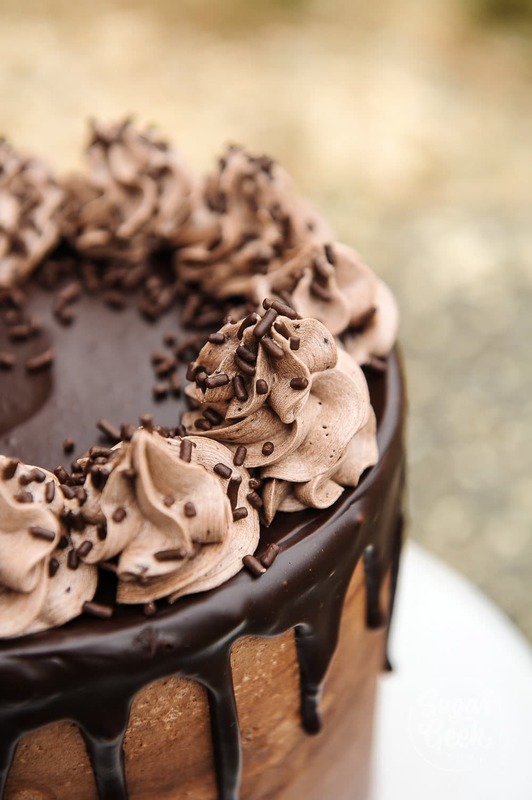 How can I decrease the sweetness-by putting less chocolate chips, less sugar in the cake and frosting? Will sugar reduction in the cake change its consistency? do you have a conversion rate from weight to measurement? 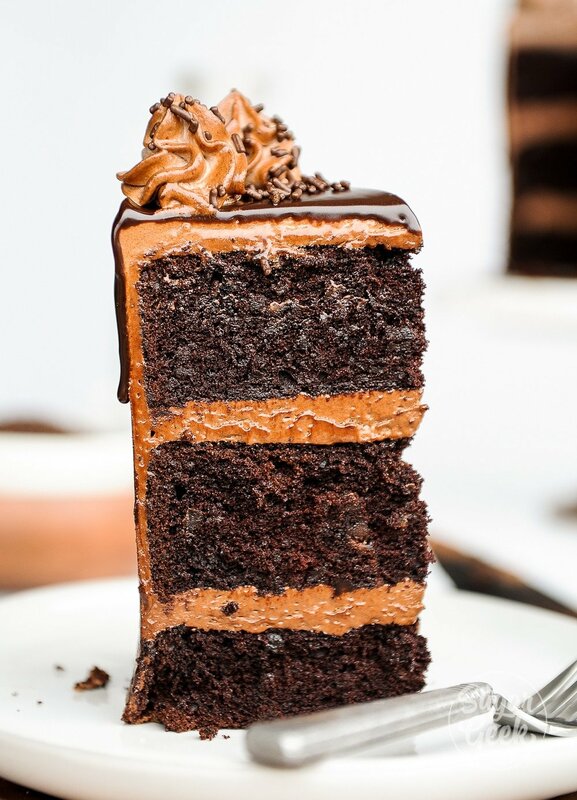 How does this work/taste with your easy chocolate buttercream icing?